A pattern of whimsical blooming cherry blossoms is the noticeable feature on this set of Japanese Ceramic Bowls. An upbeat and joyous design done in blue and white, the blossoms are carefully placed across the inside of each Japanese bowl, and set against a beautiful blue and white backdrop. However, the background is similarly detailed being dual designs of a blue and white plaid and solid blue. 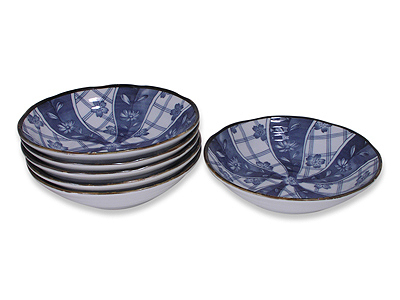 It is this stylish design that signifies each piece in the Blooming Blue and White Cherry Blossom Dinnerware Set. However, these Japanese Ceramic Bowls offer much more in terms of design. Along the exterior is a simplistic blue design of cherry blossoms on a branch. The rim of each cherry blossom bowl in this set has a slightly undulated rim and is offset by a definite, brown edge. Finished in a smooth, glossy glaze, the overall impression is pretty and refined. A classic design that fits a range of meals and cuisines. These mid-sized bowls come in a set for six, the perfect size and number to serve your whole family breakfast cereal each morning, a soup as an appetizer, or small salad. These Japanese Ceramic Bowls are perfect to purchase alongside the Japanese Dinner Plate Set or match with plates from a different collection found at Mrs. Lin’s Kitchen.